Assessment in Student Affairs, Second Edition offers a contemporary look at the foundational elements and practical application of assessment in student affairs. Higher education administration is increasingly called upon to demonstrate organizational effectiveness and engage in continuous improvement based on information generated through systematic inquiry. This book provides a thorough primer on all stages of the assessment process. From planning to reporting and beyond, you'll find valuable assessment strategies to help you produce meaningful information and improve your program. 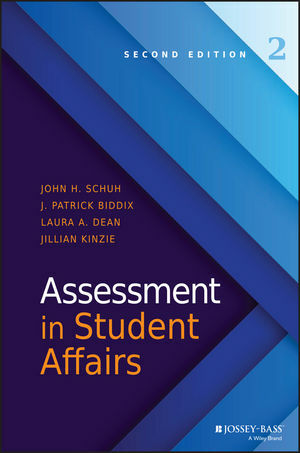 Combining and updating the thoroughness and practicality of Assessment in Student Affairs and Assessment Practice in Student Affairs, this new edition covers design of assessment projects, ethical practice, student learning outcomes, data collection and analysis methods, report writing, and strategies to implement change based on assessment results. Case studies demonstrate real-world application to help you clearly see how these ideas are used effectively every day, and end-of-chapter discussion questions stimulate deeper investigation and further thinking about the ideas discussed. The instructor resources will help you seamlessly integrate this new resource into existing graduate-level courses. Student affairs administrators understand the importance of assessment, but many can benefit from additional direction when it comes to designing and implementing evaluations that produce truly useful information. This book provides field-tested approaches to assessment, giving you a comprehensive how-to manual for demonstratingand improvingthe work you do every day. Accountability and effectiveness are the hallmarks of higher education administration today, and they are becoming the metrics by which programs and services are evaluated. Strong assessment skills have never been more important. Assessment in Student Affairs gives you the knowledge base and skill set you need to shine a spotlight on what you and your organization are able to achieve. JOHN H. SCHUH is director of the Emerging Leaders Academy and is distinguished professor emeritus at Iowa State University. He is the author of Assessment Methods for Student Affairs, from Jossey-Bass. J. PATRICK BIDDIX is associate professor of higher education at the University of Tennessee. He teaches graduate courses in assessment, research design, and methodology in student affairs. LAURA A. DEAN is professor in college student affairs administration at the University of Georgia. She is also past-president of the Council for the Advancement of Standards in Higher Education (CAS). JILLIAN KINZIE is associate director of the Center for Postsecondary Research and the NSSE Institute at Indiana University. She is the coauthor of Using Evidence of Student Learning to Improve Higher Education and Student Success in College: Creating Conditions That Matter, both from Jossey-Bass.